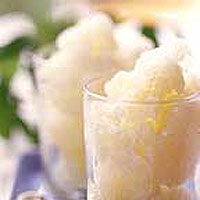 This granita is easy to make, and is a great way to cool off on a hot day. Serve it as a dessert, a palate cleanser or a refreshing snack. Put the sugar and water in a small pan and heat gently, stirring until the sugar has dissolved. Remove from the heat and cool, then chill. Quarter the melon, scoop out the seeds and cut away the skin. Roughly chop and place in a blender. Peel the ginger, grate it finely and add to the melon. Blend until smooth. Mix the chilled syrup with the melon purée. Put the mixture into a shallow container in the freezer and stir with a fork every 30 minutes or so to break up the crystals. Don't beat too hard: you want the granita to have a coarse, granular texture. After about 3 hours, the granita should be a mass of crisp crystals. Serve in well-chilled glasses.